Violinist JENNIFER KOH is recognized for her intense, commanding performances, delivered with dazzling virtuosity and technical assurance. With an impassioned musical curiosity, she is forging an artistic path of her own devising, choosing works that both inspire and challenge. She is dedicated to performing the violin repertoire of all eras from traditional to contemporary, believing that the past and present form a continuum. She is also committed to exploring connections in the works she performs, searching for similarities of voice among diverse composers and associations within the works of a single composer. 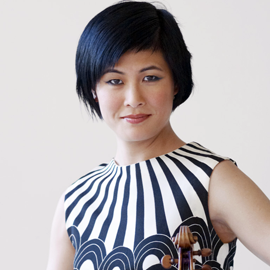 In October 2011, Ms. Koh performed, for the first time, Bachs complete Sonatas and Partitas for solo violin in a single concert  a feat long considered the ultimate test of a violinists command of her instrument  presented by Columbia Universitys Miller Theatre at the Academy of Arts and Letters. She has since played the complete works at the Castleton Festival in Virginia, at the Rockport Chamber Music Festival in Massachusetts and for Da Camera in Houston. Her interpretations of Bachs solo works, both in marathon recitals and paired with contemporary pieces, have been praised as thoughtful, intense, energetic and beautifully phrased. Since the 1994-95 season when she won the International Tchaikovsky Competition in Moscow, the Concert Artists Guild Competition, and the Avery Fisher Career Grant, Ms. Koh has been heard with leading orchestras and conductors around the world, including the Atlanta Symphony, Baltimore Symphony, Chicago Symphony, Cincinnati Symphony, Cleveland Orchestra, Detroit Symphony, Houston Symphony, Los Angeles Philharmonic, Minnesota Orchestra, Montreal Symphony, Nashville Symphony Orchestra, National Symphony Orchestra, New Jersey Symphony, New World Symphony, New York Philharmonic, Oregon Symphony Philadelphia Orchestra, St. Louis Symphony and Seattle Symphony. Abroad, she has appeared with the BBC London Symphony, BBC National Orchestra of Wales, BBC Scottish Symphony, the Brandenburg Ensemble, Czech Philharmonic, Helsinki Philharmonic, Iceland Symphony, Lahti Symphony, London Philharmonia, Moscow Radio Symphony, Singapore Symphony and the Mariinsky Theatre Orchestra where she performed the Russian premiere of Ligetis Violin Concerto conducted by Valerie Gergiev.